I don't know if I'm posting this in the right place or not! This is Rick, former owner of 60's in Paradise and The Early Bird Café. For those that are not aware, I'm selling the same Corned Beef that we sold at our restaurant for many years. 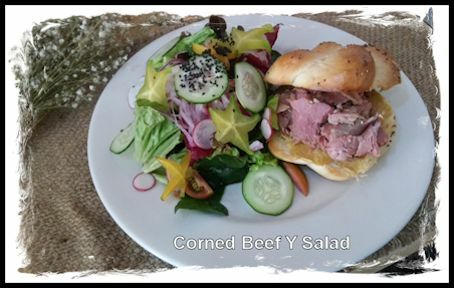 We sell it un-cooked so you can make your own version of Corned Beef & Cabbage or any other dish you prefer. St. Patrick's Day is less than a month away and we're running out fast! If you might be interested in preparing your own feast, with left-overs for sandwiches stop by our shop and talk to either Heidi or me. We are located 1/2 block west of San Andreas Church on Parroquia which is the street that runs along the south side of the Plaza in Ajijic. Our hours are 9-2 Tuesday-Saturday. If you would like more info you can call the shop at 766-5063 or call me at 331-442-3930. Hope to see you soon! Would you like to try some of Ricks Corned Beef before you buy it? Also, at Media Luna, try their Salmon, Cream Cheese, and Capers on a freshly baked Kaiser Roll....dynamite!! cornedbeefrick wrote: Also, at Media Luna, try their Salmon, Cream Cheese, and Capers on a freshly baked Kaiser Roll....dynamite!! Please check Private messages again Rick. O.k. I gave this corned beef cooking thing a whack and the results were less than impressive. It was just O.K. It was a nice cut of meat but it had been trimmed of ALL visible fat and I wasn't expecting that. Also, think I soaked it too long? It wasn't salty enough and it was pretty bland. I did follow the instructions to rinse and soak overnight but I think it would have been better if it didn't soak so long. I decided to cook it in the crock pot since it was so lean, then I cooked the cabbage and potatoes in the water after the meat was dome. It was nice and tender. I only cooked half of the meat and now I need to cook the other half. Any ideas on how I should cook it to get a better result? It is already thawed, soaked and everything. I marinate the brisket for 5 weeks. I've always had the best results cooking it in the oven at about 100C. I cover it with water, use aluminum foit for a lid as it makes a tighter seal and check it frequently with a fork. I guess the only thing I can say regarding it being "bland" is that every piece of meat is different....maybe it did not absorb the marinade as much as others. Most clients report excellent results and purchase more. I'm sorry your experience wss less than thrilling. I'll be in the shop today (Monday) if you want to stop by or you can call me at 766-5063. Maybe I can help! Do you make your CB nitrate-free or would you make it available that way, please? cornedbeefrick wrote: I marinate the brisket for 5 weeks. I've always had the best results cooking it in the oven at about 100C. I cover it with water, use aluminum foit for a lid as it makes a tighter seal and check it frequently with a fork. I guess the only thing I can say regarding it being "bland" is that every piece of meat is different....maybe it did not absorb the marinade as much as others. Most clients report excellent results and purchase more. I'm sorry your experience wss less than thrilling. I'll be in the shop today (Monday) if you want to stop by or you can call me at 766-5063. Maybe I can help! It soaked about 18 hours. I didn't thaw it out before I soaked it. Is that too long? I guess I'll try cooking the other half in the oven. Have all of your briskets been trimmed like that? There was absolutely no fat left on there! I like to trim meat after I cook it and I wouldn't have bought it had I known but I didn't even think to ask. I have never bought a Brisket that had all the fat trimmed off, fat imparts flavor into the meat while it's cooking. Does everyone remove the fat cap from brisket these days or what? I haven't bought one in a long time. How do you cook your brisket, Cbob? I trim a lot of the fat as most clients want their CB very lean. One lady that used to frequent our restaurant would inspect her sandwich. If there was one speck of fat, she would complain and not eat it. I agree that fat adds flavor and I leave a little on each piece for that reason. You might try doing a salt rub before cooking. Buena suerte! One of our friends did our last one. Low and slow in a pot with some water for about 6 hours. Cabbage is added near the end. Our friend is back this March and will be doing it again on St Paddy's. Ours was spectacular. We like our corned beef lean. I'm the guy in CBob's post. This year going to do a low and slow oven braise. Google braised corned beef. I can cook veg seperately this way in deference to a vegetarian - no meat water. I guess I don't understand the last post??? Regarding the "cap" on the brisket, if you're going to bake or smoke the brisket you do not remove the cap as you're using a dry rub. The marinade for Corned Beef is liquid and will not penetrate the cap so it is removed. I'm sure there are butchers locally where a brisket (pecho) can be purchased with the cap. Well, I guess not. Thanks for the reply. The sodium nitrate preserves the meat while it's marinating and I'd be afraid to change the process. I'm sorry but it doesn't look like I can help you! There are more nitrates in many vegetables than most preserved meats. The nitrates found in many of these veg. are even used in preserving meats. Like dried, powdered beats. While some view nitrates as bad (and they can be in large amounts) they are necessary to preserve the meats while the meat is marinading. This possess can take from 3 days up to 1 year depending one what your making. In this time and without the use of nitrate you greatly increase the chance of propagating the Botulism spores in the meat a far greater concern as the consequence is immediate and permanent. That comes to .0004 gram of nitrate per gram of meat. On the average a person would consume approximately 70 to 140 grams of meat per serving. This amount equates to .028 and up to .056 grams of nitrate per serving of meat. As you see there is 343 grams of nitrate in one cup of Rhubarb and it takes approx. 4 cups for a good size pie. A pie slices into 6 to 8 pieces per serving. In a pie cut to 8 pieces that equals approx. 171.5 grams of nitrate per serving. A side note: people often use dried powdered Rhubarb for preserving meats but it's not very cost effective and increases the nitrate intake per serving anyway. Currently there is no way of knowing the amount of nitrate being used with dried veggies (nitrate per gram of dried veg.) So the person needs to use caution on the high side and use more to be safe.